Friday 1st June 2017 marked National Fish and Chip Day, and what better way to celebrate that than having the largest cod and chips that the restaurant can offer. It was so big, it could have fed more than 2 of us, but luckily we were taking it home as we had something new to try this classic dish with. 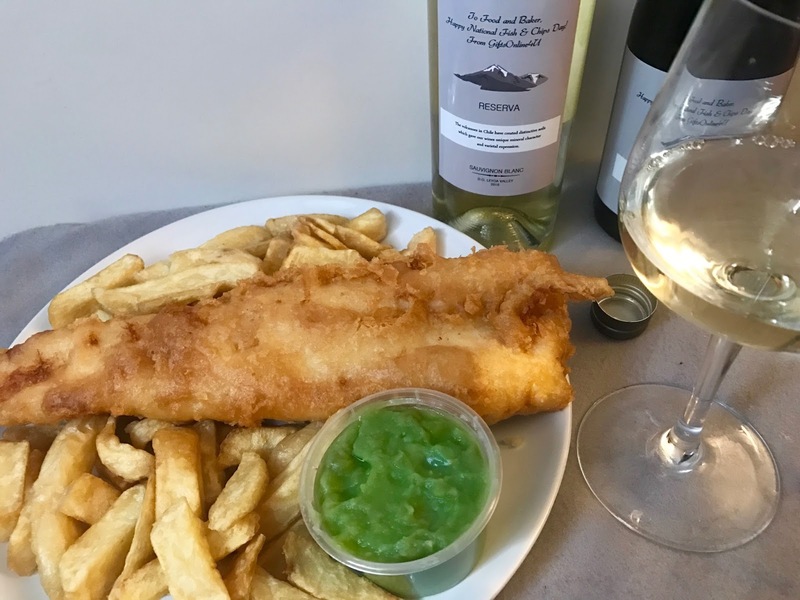 Who knew that wine would be the perfect compliment for fish and chips? Yes, you read that right, wine! Or are we the weird ones for not knowing that this was such a great pair? 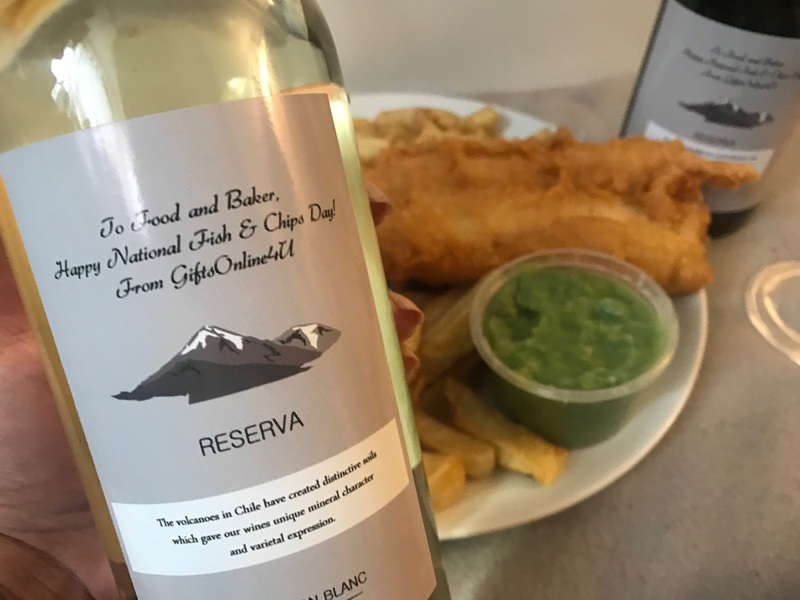 We’re both white wine kind of people, rather than red, but we had one of each to try it with, and it turned out that they both complimented the fish and chips equally as well. These weren’t just any wines though – they were specially selected personalised wines from GiftsOnline4U.We personally think it’s a fantastic initiative as it would make the perfect gift for almost any occasion, and their selection of wines is sure to give you enough options to please a friend or loved one. The personal designs give you endless options, with the possibility of having both images and text on your bottle. Volcanes Reserva Sauvignon Blanc – this had notes of lemon and lemon zest; white flowers, minerals, herbs and white pepper. The lemony, fruity taste provided a very refreshing drink to have alongside the fish and chips. Red Reserva Pinot Noir – this is a medium red wine, with the taste and smell dominated by fresh red fruits, and undertones of tea, herbs and spicy notes. As we said, although we’re not typically massive fans of red wine, this one went down a surprising treat! 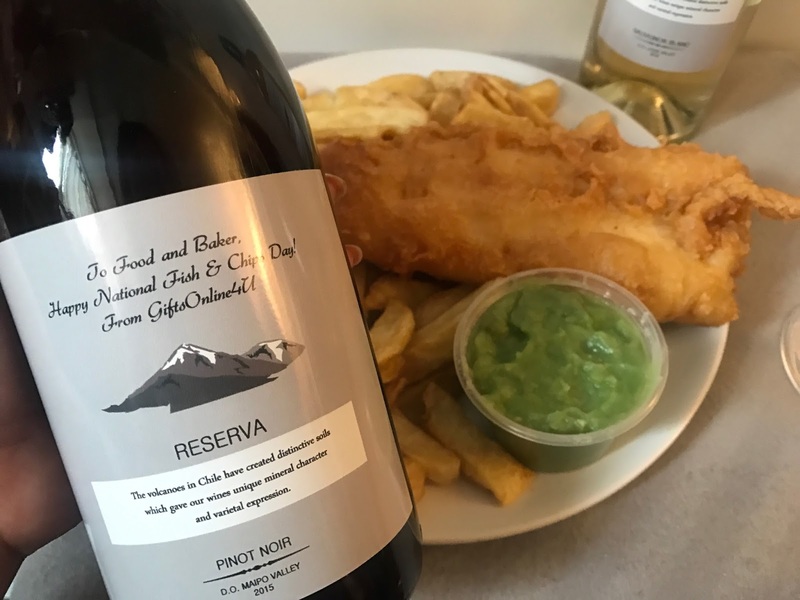 Have you had fish and chips with wine? Do you prefer white wine or red? Let us know in the comments below. Disclaimer: we were sent the complimentary wines in exchange for a review for National Fish & Chip Day. But as always, all our opinions and photos are our own. I've never had fish and chips with wine, I only have a glass of rose very rarely, not a wine fan. Oh wow how lovely for the wine bottle to be personalised!! I love fish a chips, I wish I could have some now!!! ahhh! Those fish and chips look AMAZING! 😍 I'm not a wine drinker (in fact I don't really drink at all!) but the bottles are so cool, and the descriptions make them sound really nice!